This book provides a detailed exploration of the relationships between individual architects, educators, artists and designers that laid the foundation and shaped the approach to designing new school buildings in post-war Britain. It explores the life and work of Mary Medd (née Crowley) (1907-2005) who was alongside her husband and professional partner, David Medd, one of the most important modernist architects of the 20th century. Mary Medd devoted the major part of her career to the design of school buildings and was pioneering in this respect, drawing much inspiration from Scandinavian architecture, arts and design. More than a biography, the book draws attention to the significance of relationships and networks of friendships built up over these years among individuals with a common view of the child in educational settings. Dr Catherine Burke is an historian and senior lecturer in education at the Faculty of Education, University of Cambridge. 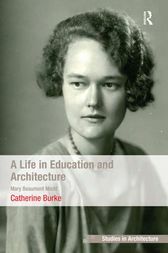 She has researched Mary Medd's life and travels since the architect's death in 2005, while at the same time engaging with architects designing schools today to bring about a better understanding of the history of the subject. Other related publications include The School I'd Like (2003) and School (2008) both with Ian Grosvenor.